A reminder that Glenelg is hosting the Lifesaving World Championships 16th November – 2nd December. Sean, Tina Williams, Heather Eckert and Kate Newman will be on the beach Monday to Wednesday. Cooper Clee and Ella Andrews hit the sand 27th – 29th November. Nic Schulz and Connor Tunbridge will be in action 30th November – 2nd December. We wish them all well and are proud that the Club will be represented on an International stage. Interested in getting your IRB Drivers Qualification? Ensure that you have been building your crew hours in the water and undertake your boat license. Here is a course to support you, run by a Glenelg Member. Please note that you can apply direct to Services SA for a boat licence test if you would prefer. Please register interest for the course and ensure that you have updated your online portal with your Boat Licence number. The next Semaphore Club proficiency is running on Sunday 28 October so please come along from 11:30am to undertake Bronze & ARTC updates and assessment. All Patrolling members are also required to complete Safer Clubs and Safeguarding Children and Young People Awareness Course which is located in the Safety and Wellbeing rather than in the Skills Maintenance. The First Training Patrol of the season was well attended by a range of people training for both SRC and Bronze, some using it as a refresher and others starting from scratch. The group concentrated on The Human Body, Defibrillation and basic oxygen and Radio Operation as well as waterwork. 4 out of the 6 Patrols will have a trainer to support our commitment to getting members qualified. Last weekend (5th to 7th of October) approximately 30 of our young members, undertook their SRC & Bronze Top-Up training. In what must surely be record numbers in one intake, the students & trainers committed to 3 days of long and intensive training both in & out of the water. Whilst the weather was pleasant outside of the water, feedback was that each of the students now understand what it is like to be a Polar Bear!! As a club, Semaphore is extremely proud that such a large percentage of our junior/youth members are transitioning from competition to patrolling members. Given we primarily exist as a Community Volunteer Service Organisation, such large numbers augurs well for the coming years. Many thanks to Heather Eckert as the principal trainer for the three days. Heather was ably and gratefully assisted by several volunteers handling water cover and other tasks. Thanks also to Jennie Charlton and her team for helping co-ordinate such a monumental achievement. The feedback from all the students was extremely positive both on the training itself as well as our new Training Facilities. It’s been an eventful week with lots of little bits and pieces finally going in to place. 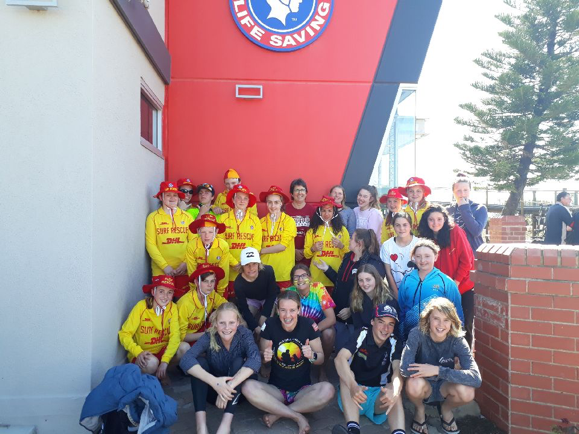 At the start of any season there are many newcomers across all age groups, and I’m sure we tried and true members can all remember starting and being very unfamiliar with Surf Life Saving practices so if you see anyone looking lost or not sure what to do next reach out and lend a helping hand. 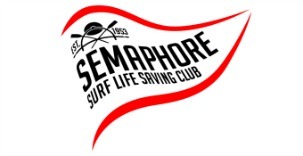 Semaphore Surf Life Saving Club has long been known as a Family Club and we want to ensure that that tradition continues. The SSLSC Nippers will have their own Facebook Group this year, which will hopefully launch with the start of the season, making it a one stop shop for all Nipper related information. Keep a look out for more news here. Accepted colours are Yellow / Pink / Combination Pink-Yellow purchased from last years State Titles. Green will not be accepted as per Surf Life Saving SA guidelines. The club caps must be worn at all training sessions, this includes board training. We are in contact with a possible March Past Coach too so we will hopefully have a full contingent of Coaching Staff to start the season with. Surf Life Saving Australia’s Competition Eligibility Policy provides members with the latest information regarding the undertaking of qualifications and/or proficiencies to ensure you are eligible compete this season. Please click HERE for the full Policy Document. Wanting to increase your skills or maintain your current qualifications? 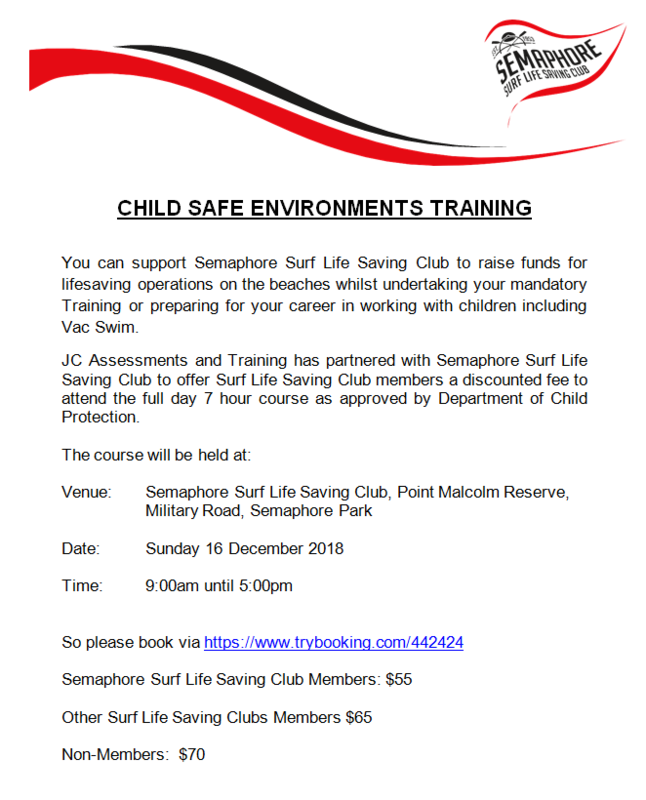 There are many training opportunities coming up at Semaphore SLSC. Click HERE for a full list of training programs and dates. Online Proficiencies are available now! Please use this guide to help you complete your online proficiency. Patrols will be commencing on Saturday 13th October so use this month to prepare. SRC’s undertaking their Bronze Medallion in October do not need to complete SRC Proficiency. All patrolling members are required to complete Child Safe online.